A wet growing season is bad news for an onion crop. 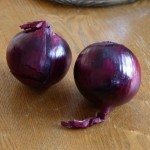 Many diseases, most of them fungal, invade the garden and ruin onions in times of warm, moist weather. Read on to find out about onion diseases and their control. It’s difficult to tell the difference between the many diseases affecting onion plants. Even the experts often have to rely on laboratory tests for a definitive diagnosis. Fortunately, you don’t have to know exactly which disease has infected your plants to take action. Onion plant diseases arise during warm, moist weather and most have similar symptoms, which include spots and lesions on leaves and bulbs, areas that look as though they are water-soaked, browning foliage and toppling. There is no method of treating diseases of onion, and you can’t reverse the damage. The best course of action is to focus on next year’s crop so that it doesn’t happen again. Place your onion patch on a three- or four-year rotation. 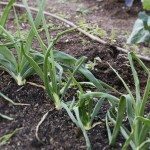 You can grow other crops in the area in the intervening years, but avoid members of the onion family, such as garlic and scallions, as well as ornamental alliums. Avoid fertilizing with nitrogen after mid-season. Nitrogen fertilizer delays the development of bulbs and gives diseases more time to infest your crop. Discard culls and other organic debris promptly. Fungi overwinter in debris left in the garden, and this includes onion plant matter that you till into the soil. Good sanitation helps keep disease pathogens out of the garden. Take care when using a cultivation tool around onions. Cuts in the bulbs and foliage create an entry point for disease spores. Buy seeds, plants and sets from a reputable garden center. Buy material that is certified disease-free whenever possible. Disease spores can also invade onions after harvest. Spread onions on a table or screen to dry after harvest. Make sure air circulates freely around them. Pull and discard diseased bulbs. Disease spores can spread by wind and by water splashing soil onto the plant. The spores also travel from plant to plant on your hands, clothing and tools.